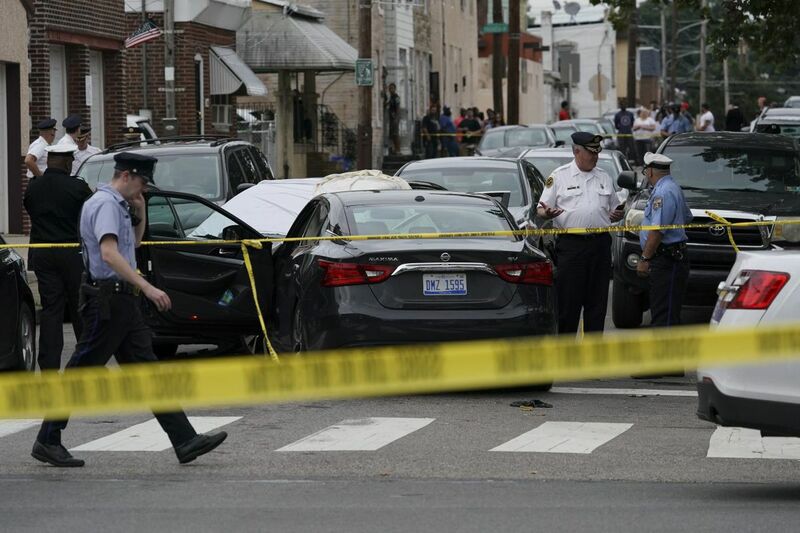 Police fatally shot a man who allegedly struck an undercover officer with a car Monday afternoon in the city's Tacony section, police said. The suspect, who was not identified, hit the officer with a black Toyota Camry shortly after 4 p.m. in the 7100 block of Hegerman Street, near Princeton Avenue, said Capt. Sekou Kinebrew, a police spokesperson. Another officer who was not injured during the confrontation fired three shots into the Camry, killing the suspect, said Kinebrew, who briefed reporters a block from the scene. The officer who was hit by the car suffered an injury to his right knee. Two other officers also were injured at the scene, but how they were hurt was unclear, Kinebrew said. All three officers were in stable condition at a local hospital. Undercover officers with the Northeast Narcotics Field Unit had been preparing to serve a search warrant at a house in the 7100 block of Cottage Street when they saw the subject of their investigation driving the Camry, Kinebrew said. The officers followed the Camry in their own vehicle for several blocks until it stopped on Hegerman. The plainclothes officers exited their vehicle to approach the suspect when the Camry started moving and struck one of the officers, Kinebrew said. The officer who fired the shots is 53 years old and has been on the force for 10 years, Kinebrew said. Medics pronounced the suspect dead at 4:18 p.m.
Kinebrew said police knew the suspect from the investigation but were still trying to verify his identity. Rita Grace, 31, said she was home with her husband, Jim Strahan, 36, when they heard the gunfire. "Three pops. Three loud 'pop, pop, pop,' " Grace said. She went outside and saw the suspect slumped over the steering wheel of the car. "It was pretty scary," she said. The couple said the neighborhood has a problem with drugs and prostitution, particularly coming from nearby Torresdale Avenue. "I just want to move out of here so bad," Grace said.